A dust collection system is essential to any manufacturing process that creates nuisance or harmful contaminants in a confined environment. A dust collector filters particulates from factory air, collects the dust for disposal, and returns clean air to the environment. Alternatively, the dust collector can be an integral part of a powder processing system. If a dust collector is improperly sized, the escaped particulate matter can be harmful to the employee’s breathing and overall health. The dust can clog or lower the efficiency of factory equipment, and increase maintenance costs. 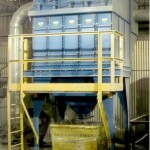 In a process system, an improperly sized dust collector can restrict or limit production rates. When the correct dust collector size is chosen, it will operate at peak efficiency, improving safety, compliance and overall productivity. Multiple factors must be considered when selecting a dust collector system. With an understanding of these basic parameters, you will see why their calculation and application to your baghouse will benefit your process. Determining the correct size dust collector for your factory provides a budget-wise return on investment. The three primary calculations to determine the dust collector size you need are air volume, air-to-cloth ratio and interstitial velocity. Air volume is the amount of air that will pass through the dust collector for cleaning. This is measured in cubic feet per minute (CFM). In this calculation, fpm is feet per minute of air velocity. Depending on the dust characteristics, the correct CFM value should be approximately 100–200 feet per minute of air velocity multiplied by the cross-sectional area of the hood in square feet. Accurate measurement of the volume of air going through the baghouse is vital for adequate ventilation. Inadequate ventilation can clog equipment, create an unsafe working environment and increase problematic environmental emissions. If there is any question about the correct CFM for your process, contact your professional baghouse supplier. Within the baghouse, cloth filter bags are the workhorses in the dust collection process. These filter bags (also known as filter socks or filter tubes) are suspended from a tube sheet in the baghouse. Dirty air passes over or through them (depending on the baghouse technology used), and the dust adheres to the filter media. In a pulse-jet collector, the bags are cleaned automatically without interruption of filtration (on-line cleaning). The air-to-cloth ratio is the volume of air passing through one square foot of filter media. A conservative air-to-cloth ratio can extend filter life, while a higher air-to-cloth ratio could shorten the filter life. This ratio should be customized to the specific application conditions for maximum efficiency and filter life. To calculate the air-to-cloth ratio, divide the air volume flowing though the dust collector’s inlet ducts by the total cloth area. The importance of the correct air-to-cloth ratio becomes even more evident in the interstitial velocity. To design a dust collector for proper interstitial velocity, several types of adjustments can be made to add more space and more collection area. 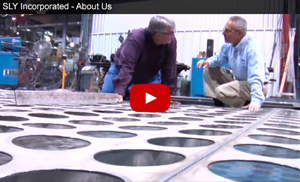 Dust collection is an essential and often-regulated component of any process that produces dust. Working with a reputable professional supplier or OEM will ensure that your air quality goals and dust recovery requirements are met. A baghouse that is too large for the facility is a waste of resources in terms of cost, footprint and energy. Go too small with your baghouse, and it may appear you’ve saved on your initial investment, but the inefficiencies in collection could harm your staff, equipment and output. Sly is happy to work with you to get just the right size baghouse. You can contact us or request a quote. We look forward to helping you.